This contest is now over. Thanks to everyone who entered! If you've been following my message board posts on various websites, the fact that I don't like the new direction the Rocket-Dan's taken in the Best Wishes! series is obvious. Among my long lists of complaints I have about the trio is that their new personalities (or lack of) kind of prohibits them from doing those Nyasu Boss Fantasies we used to get every so often. You know, the ones where Nyasu would dream up these ridiculous uses for the pokemon they're eyeing, and Sakaki-sama's equally ridiculous reactions? Well, let's do what the writers of Best Wishes! aren't going to do. Let's make our own. The contest is simple. I want you to write out, in 300 words or less, a Nyasu Boss Fantasy for any of the 156 Isshu pokemon that debuted in Pocket Monsters Black & White. What ridiculous uses for Yabukuron could the Boss have? Why would Musashi, Kojirou, and Nyasu want to go after Buffaron? Let me know! Bulbapedia has a great list of the Boss Fantasies that have already been done, for those of you who need some inspiration. You can write the fantasy out as a script, or you can write it out in regular prose form. Assume that everyone involved has their pre-Best Wishes! personalities. I don't care if you use Japanese names or dub names. The winner of the contest will be able to pick three episodes of the TV series and have me do episode comparisons of them. I usually try to do the episode comparisons in order and don't like to jump around that much, but I'll be willing to break that self-imposed rule for whoever sends in the most amusing entry. There are some restrictions, however. I won't do any non-TV episodes. That means no movies, no TV specials, no OVAs, or any other "extra" thing. Only main TV series episodes. I won't be doing the first 43 episodes of Kanto, since I've already redone those. Same goes for any DP Galactic Battles and DP Sinnoh League Victors comparisons I've already done. I won't be doing "Princess vs. Princess" because I know the paint edits in that episode alone will take forever to get through. I won't be redoing Pokemon Chronicles because I don't know if I could stomach sitting through those episodes again. Other than that, any three episodes you pick are OK. Late Kanto, Orange Islands, Jouto, Houen, Battle Frontier, Diamond & Pearl...it's all good. The episodes you pick don't have to be consecutive, so you can pick a random Orange Islands episode and a random Jouto episode and another random Jouto episode, if you want. There are a couple of ground rules, of course. Failure to follow these rules will disqualify you, so please make sure you've followed all the guidelines before making any submissions. You may enter as many as times as you like. Send all entries to dogasusbackpack@gmail.com. All e-mail submissions must contain the words "Boss Fantasy Contest" in the subject title. Any entry without this subject title will be disqualified. Any entry longer than 300 words will be tossed out, so make sure you check the word count before submitting. If I can't understand your entry due to misspellings / grammatical errors, or is otherwise too difficult to understand, I'll delete it. You don't have to have perfect spelling and grammar, but at least try to have the bare minimum to make yourself understandable. All entries need to be submitted by January 10th, 2011 by 12:01am EST. Google "time zone convertor" or any similar phrase if you're unsure of when that is in your part of the world. If you have any other questions, please feel free to e-mail me at dogasusbackpack@gmail.com. I'll be on vacation and may not be able to check my messages all that often, so please understand if I go a few days without responding. 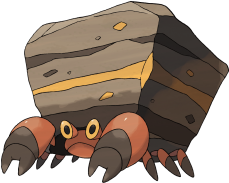 The winning entry was submitted by watchermark and has to do with the "hermit crab" pokemon, Iwapalace. Here's the pokemon in question, for those of you who need the refresher. Ash and friends are standing with an Iwaparesu. James: "Iwaparesu, quite an unusual Pokémon." Meowth: "Perfect for 'da boss! Dig it..."
Meowth: "The boss must have to deal with so much paperwork to keep Team Rocket running he doesn't know what to do with it." Giovanni's desk is now swamped with papers. Iwaparesu wanders over. Meowth: "Just as he's about to collapse with frustration, Iwaparesu will be there to allow 'da boss to get his workplace back in working order." Next, Giovanni is in the cafeteria but all the tables are full and he's carrying a heavy looking tray. Meowth: "And when 'da boss is searching for a seat at lunch, carrying his meal will make him tired." Giovanni is now sweating. Iwaparesu wanders over. Giovanni places the tray on Iwaparesu. Meowth: "With Iwaparesu around, 'da boss can look for a seat without all that added effort." Giovanni finds a seat, Iwaparesu following with the tray. 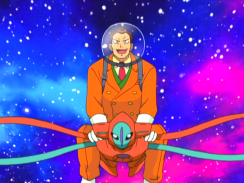 Finally Giovanni is sitting down with throbbing feet. Meowth: "And at the end of the day, 'da boss will be desperate to put his feet up." Iwaparesu wanders over. Giovanni places his aching feet onto Iwaparesu's rock. Meowth: "Iwaparesu will be there again! And as the boss relaxes, he'll say..."
Giovanni: "This Iwaparesu has helped me out, and I'll have to reward Mewoth and his friends for helping me out too!" Trio: "We'll have money, promotions, and respect. Oh boy!" Congratulations! I hope you guys out there enjoyed this entry as much as I did! Pocket Monsters Episode 136, "The Valley of Lizardon! Until the Day We Meet Again!!" ("Charizard's Burning Ambitions"), the episode where Lizardon leaves to train in the Lizafic Valley in the Jouto region. Pocket Monsters Diamond & Pearl Episode 055, "Aipom and Buoysel! Respective Roads!!" ("Throwing The Track Switch"), the episode where Buoysel and Aipom are traded. Pocket Monsters Diamond & Pearl Episode 128, "The Battle Pyramid! Shinji vs. Jindai!!" ("A Pyramiding Rage! "), where Shinji fights against the Frontier Brain Jindai. It took me nearly nine months before I was even ready to post the first of these three comparisons and my sense of guilt kind of pushed me to be more thorough than I usually am. I hope they were worth the wait! Congratulations again to watchermark for winning this site's very first contest!